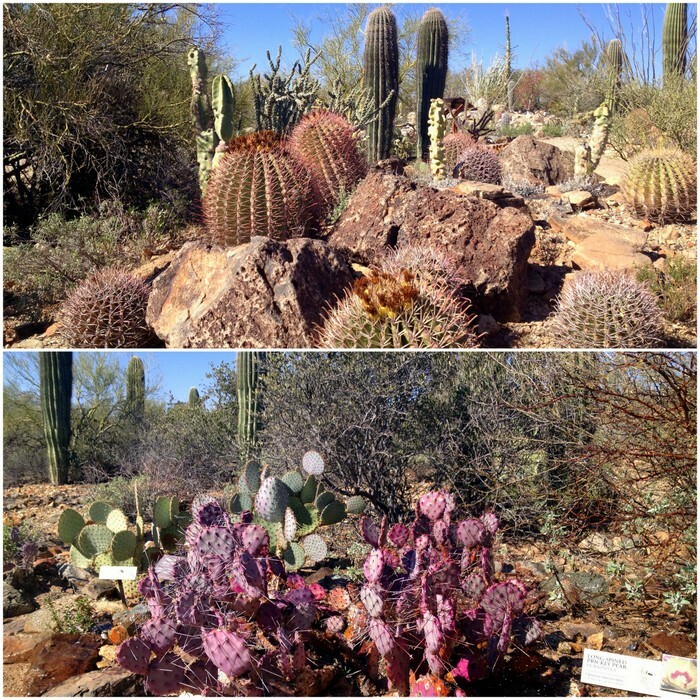 The Tucson Mountain Park is a nature lover’s paradise. 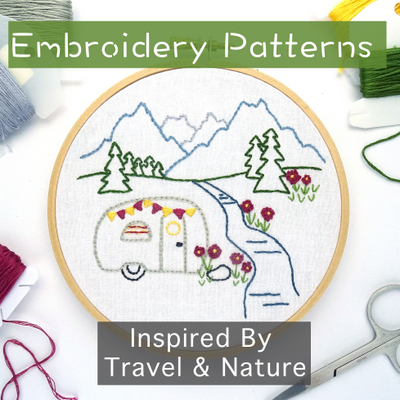 We’ve been so busy enjoying the delights right out our back door that besides one necessary trip to the laundromat & grocery store, we haven’t ventured into town at all this week. 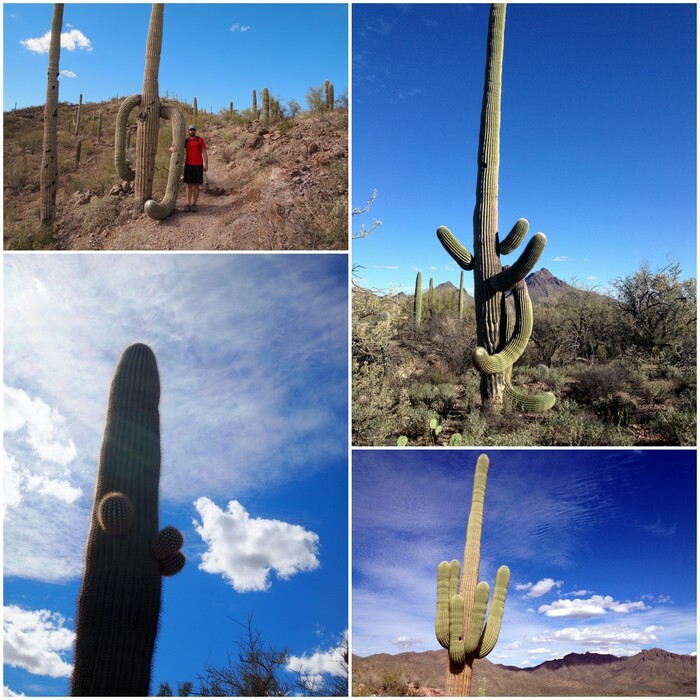 Instead we’ve kept busy with two hikes, a visit to the Arizona Sonora-Desert Museum, a trip to see some cool petroglyphs at the national park, and our quest to seek out the rare crested saguaro cactus. Our first hike was a six mile loop up and around Brown Mountain. We choose this hike not only because the trail-head is right across the street from Gilbert Ray, but also because it was supposed to be a great hike for finding Geocaches. Remember when I told you how Leigh and Brian introduced us to this fun treasure hunting game back in Ajo? Well, we are officially hooked. We even got ourselves a proper GPS device which makes the game much easier than trying to use the not-so-reliable GPS on our phones. During the hike we found 7 Geocaches! Some were right off the trail and some we had to hike a bit extra to get to. Since we already enjoy hiking, Geocaching has turned out to be a great way to add even more fun to one of our favorite activities. I only wish we had tried it sooner. The hike wasn’t all about Geocaching though. The scenery from the top of the mountain and along the ridge line was outstanding and when we weren’t searching for treasure we were admiring the amazing view of the desert below. 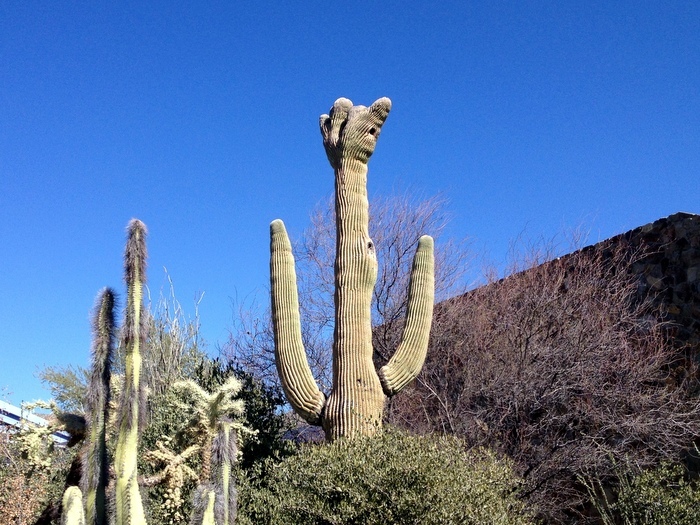 We were also entertained by the crazy saguaro cacti all around. Even after spending almost three weeks surrounded by these giant wonders, we’re still in awe of them. The next hike was all about a different kind of treasure hunt. 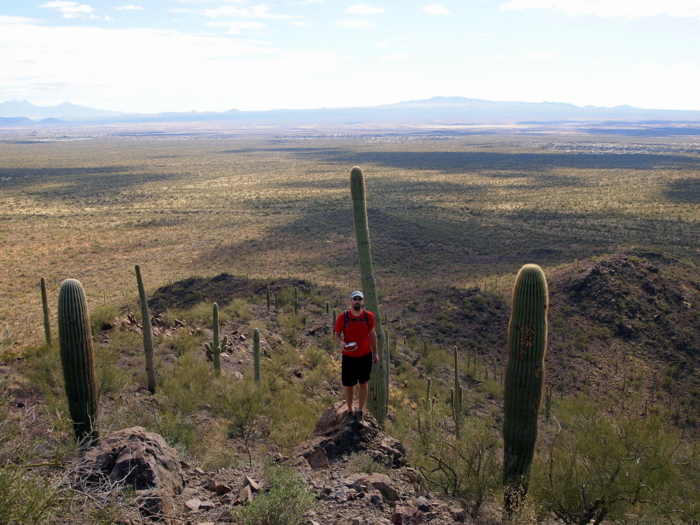 This time we were in search of the elusive crested saguaro. 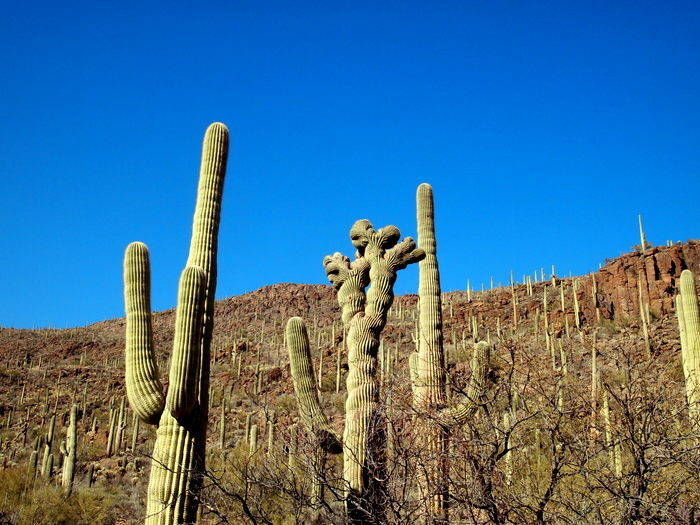 We first encountered a crested cactus during our visit to the Organ Pipe Cactus National Monument. The crest part of the cactus is basically a deformity that causes the plant to grow in a strange shape, not consistent with it’s normal form. 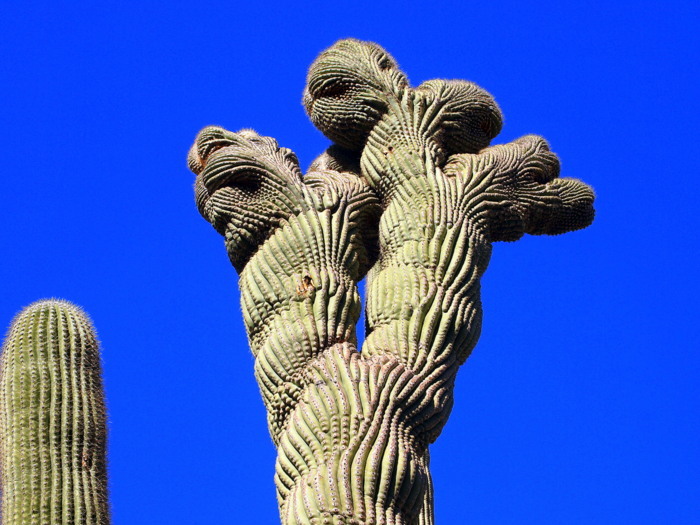 Many types of cacti can become crested, but for all it’s a rare occurrence. 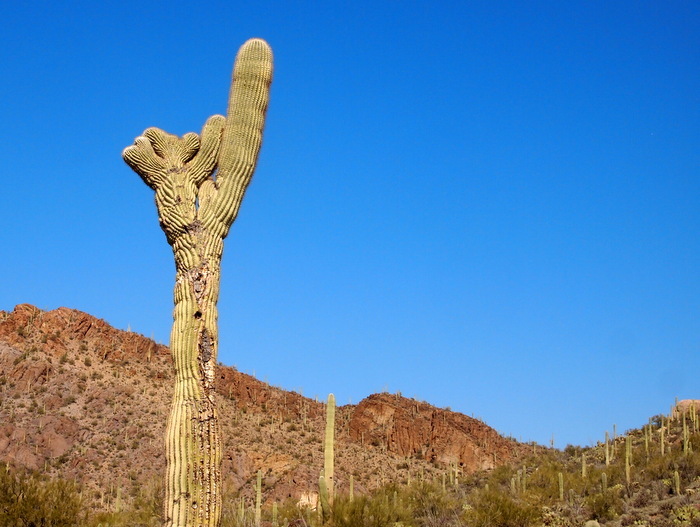 Estimates are that among saguaros cresting only occurs in 1 in every 10,000 cactus. Hmm…it sounds like the challenge to find one is on. We found two of the crested saguaros right where Pam said they were. One near the trail-head, and one just a few feet away from the Yetman Trail. Success! We also spotted a few more rarities on and near the trail. First a golf cart parked at the trail-head with a “I am Vermont Strong” license plate. We never did find the person who belonged to this cart, but it was nice to imagine that a fellow Vermonter might have been on the trail with us. Second was a very cool orange house near the edge of the trail that was much admired by both of us. This brilliant colored house would have looked out of place in any other setting, but out here among the muted brown mountains and sage green foliage it fit right in. 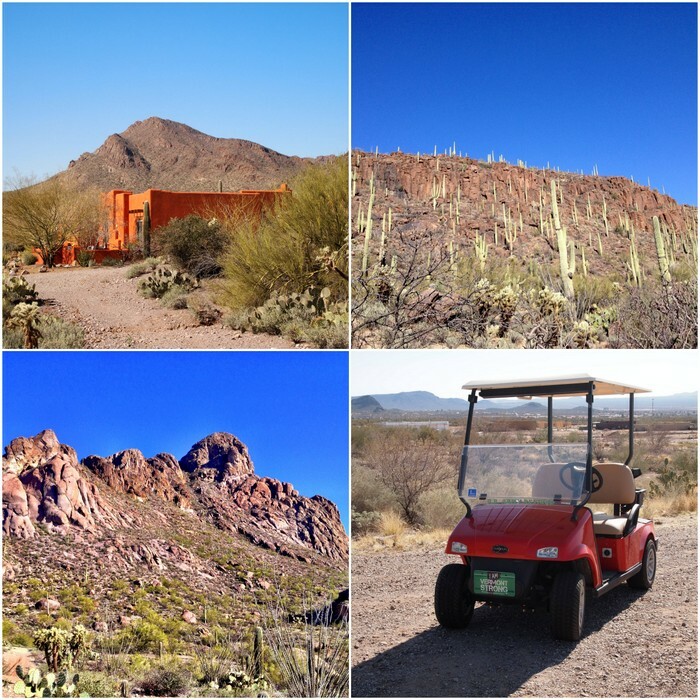 Love this orange house, Stately saguaros on the hill, desert beauty, a fellow Vermonter? Our next two crested saguaro sightings were at the Arizona Sonara-Desert Museum. While still impressive to look at, seeing them at the museum was not nearly as exciting as spotting them in the wild. The first one in the parking lot we didn’t take a picture of, but here’s the other one inside the museum. 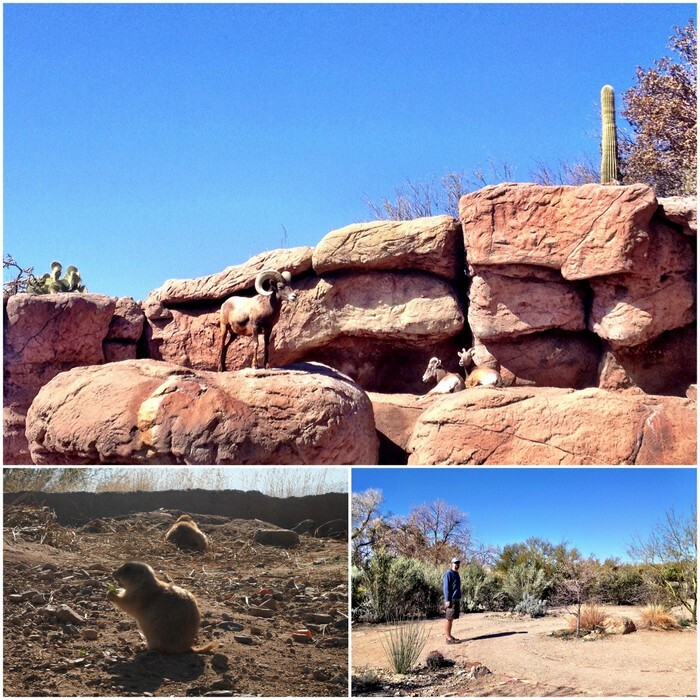 The Desert Museum is just a few minutes drive from Gilbert Ray Campground, and everyone who visits the area says it’s a must see. It’s actually more of a zoo/botanical garden than a museum. Most of the exhibits are outside and you wander through a maze of native plant gardens and animal enclosures. Unfortunately, someone (okay, it was me) forgot to put a new battery in the camera so after just 3 shots the stupid “out of battery” signal started flashing. Why, oh why did I not bring an extra battery? When will I ever learn? I did take a bunch of pictures with my phone but since iphones don’t have a very good zoom capacity, and most of the animals were far away, I didn’t really get any good pictures. All of the animals at the museum are native to the area. Some, like the poor Mexican Wolves, live in zoo-like habitats with fake rocks and very little room for exercise.While others, like the Javelinas and coyotes, roam around in massive fenced off areas full of natural plants and other landforms. During our visit many of the animals seemed to be hiding from the mid-day sun and were tucked out sight. The museum does a great job with educational signs though, and even when we couldn’t find the actual animal we were able to learn all about it. They also have labels on almost all the plants in the museum which was really fascinating since we’ve been around many of these same plants for quite a while now. Some of the names, like Ocotillo and Cholla, are already familiar to us. But there are tons of different kind of cactus and it was fun to learn the names of those we’ve been spotting on our hikes. 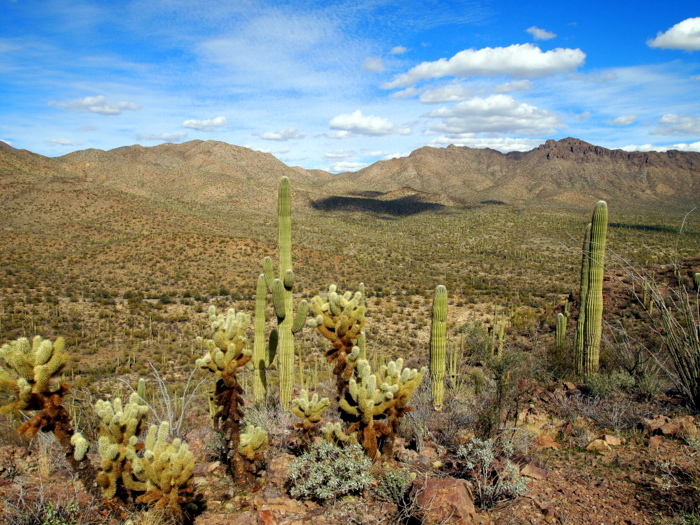 Our final excursion in the Tucson Mountain Park was a trip into the western section of the Saguaro National Park. 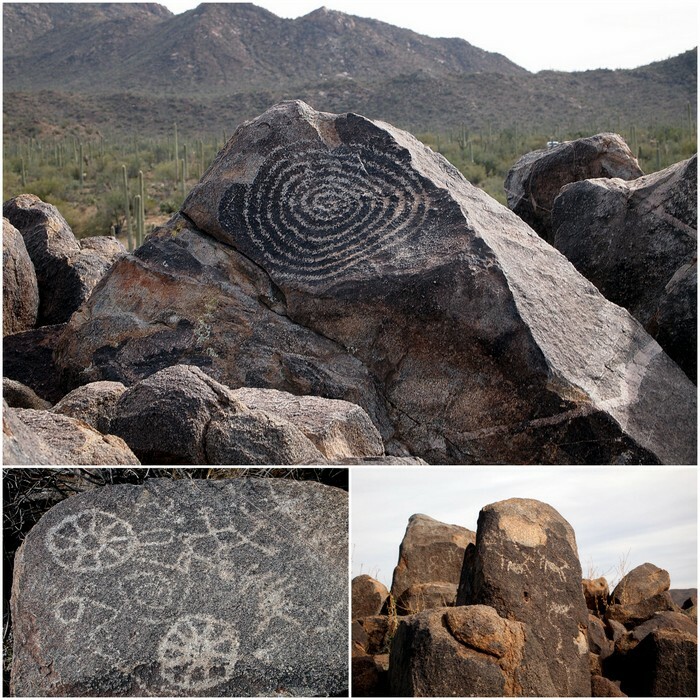 There are tons of hikes in the park, but for now we skipped the longer hikes in favor of a trip to the visitor’s center, a drive on Hookam Rd and a short walk up Signal Hill to see the petroglyphs. This morning we’re leaving Gilbert Ray and heading over to Catalina State Park in the north-east part of the city. 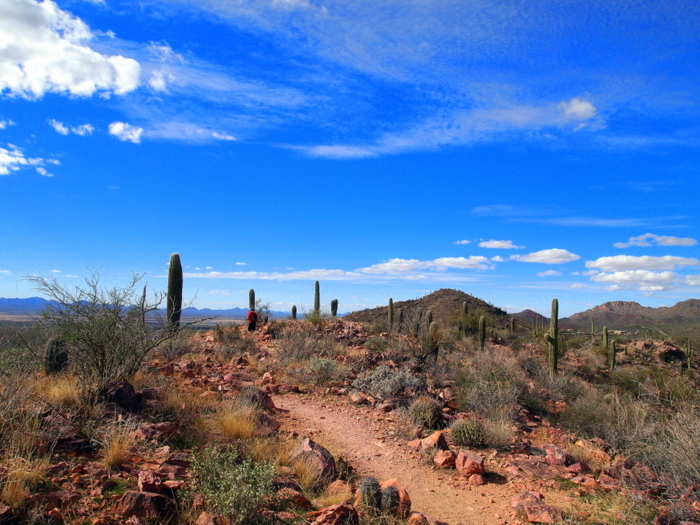 From there we are in the perfect location to explore the eastern section of Saguaro National Park. We’ve made some decisions about our future route (I’ll share them with you in a later post) which involve staying in Tucson probably until the end of the month. Since Gilbert Ray has a 7 day limit we decided to move to Catalina SP where we will remain for the 14 day limit before returning to Gilbert Ray for another 7 days. We do love public parks, but these restrictions can be a bit of a hassle sometimes. Love the shot of Tim with his arm around the cactus! Hard not to be awe of such giant wonders! That hairy cactus is a senita cactus or “Old Man Hairy Beard.” I just learned this from another blog. So glad you found that cresty! I loved the twisted trunk. I did read online and saw a picture that there is one on the Sutherland Trail. Haha- I love that cactus name! Yes, we did see your post about that hike in the SP and it’s in the plan for next week. Sounds like fun!